Woodhaven Lumber | Look North Inc.
A website designed to showcase quality products and extensive expertise and built to capture leads from both consumers and builders. 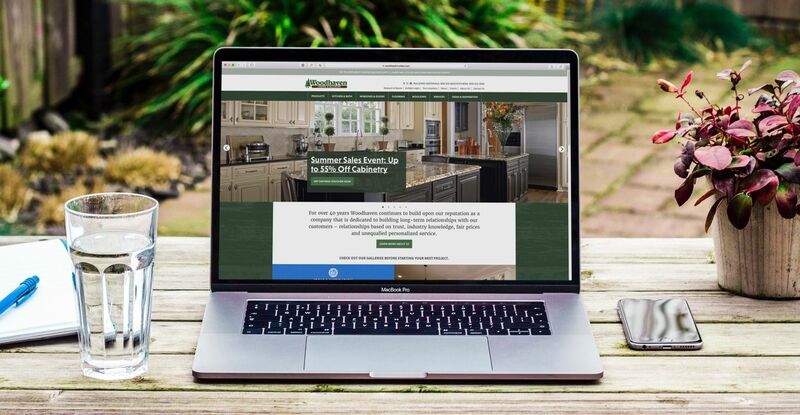 Woodhaven Lumber had a list of issues they had with their Wordpress website and a set of goals and requirements that they were hoping to implement as part of a redesign. At the top of the list were more powerful and flexible lead generation tools as well as ADA compliance for accessibility. And, the site had to be effectively managed by a small but capable marketing department. Our website overhaul was a project of true partnership with Look North. They took on our site like it was their own. They always put the best interests of our business goals first. We started the project with a series of discovery sessions with various departments within Woodhaven, including their sales, installation and customized product teams. By doing this, involving the various teams and understanding their use of the site and workflow we were able to put together a content strategy and site architecture that focused on a number of user goals, each resulting in a specific call-to-action. We also worked with the marketing department to understand how they needed to manage the site based on their capabilities and their planned marketing campaigns. How about a flexible space to feature your promotions right on the homepage? The homepage carousel allows the marketing team to feature content from throughout the site and drive traffic to specific pages based on current campaigns. Fun iconography, an expanded color palette and flexible typography. The design of the site brought new life to the established branding and identity. We created a color palette that helps differentiate site sections. And, we created a system of iconography that helped guide users through the process of requesting more information or a quote on services. Looking for a product when on-the-go? No problem. By building on a fully responsive framework we allow for a great browsing experience no matter the screen size. This means potential customers can access Woodhaven's extensive product lines from anywhere. Does it come in blue? Do you have something more traditional? An online Ideas & Inspiration gallery lets customers browse through many photographs of products within a range of categories. The photos are provided by the manufacturers and are designed to help inspire the builders or home owners. And, if the customer would like more information on a particular photo, no problem. Easy-to-use CTA buttons include image details so the sales team knows exactly what the customer is interested in. Simple contact forms and strong calls to action in relevant places lead to successful conversions. Nobody likes to fill out forms. That’s why keeping them as short as possible, yet still capuring the neccesary data is one of the site's key features. And, by placing relevant forms in obvious places throughout the site visitors can quickly get more information. Ad Words campaigns with custom landing pages are a powerful combo. Marketing landing pages were designed to look and feel a bit different from the rest of the site and be flexible based on the campaign and tracking needs.